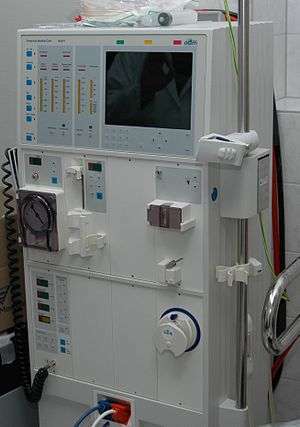 Acute kidney injury (AKI), previously called acute renal failure (ARF), is a rapidly progressive loss of renal function, generally characterized by oliguria (decreased urine production, quantified as less than 400 mL per day in adults, less than 0.5 mL/kg/h in children or less than 1 mL/kg/h in infants); and fluid and electrolyte imbalance. AKI can result from a variety of causes, generally classified as prerenal, intrinsic, and postrenal. The underlying cause must be identified and treated to arrest the progress, and dialysis may be necessary to bridge the time gap required for treating these fundamental causes. Acute kidney injury (previously known as acute renal failure) - or AKI - usually occurs when the blood supply to the kidneys is suddenly interrupted or when the kidneys become overloaded with toxins. Causes of acute kidney injury include accidents, injuries, or complications from surgeries in which the kidneys are deprived of normal blood flow for extended periods of time. Heart-bypass surgery is an example of one such procedure. Chronic kidney failure is measured in five stages, which are calculated using a patient’s GFR, or glomerular filtration rate. Stage 1 CKD is mildly diminished renal function, with few overt symptoms. Stages 2 and 3 need increasing levels of supportive care from their medical providers to slow and treat their renal dysfunction. Patients in stages 4 and 5 usually require preparation of the patient towards active treatment in order to survive. Stage 5 CKD is considered a severe illness and requires some form of renal replacement therapy (dialysis) or kidney transplant whenever feasible. Before the advancement of modern medicine, renal failure was often referred to as uremic poisoning. Uremia was the term for the contamination of the blood with urine. It is the presence of an excessive amount of urea in blood. Starting around 1847, this included reduced urine output, which was thought to be caused by the urine mixing with the blood instead of being voided through the urethra. The term uremia is now used for the illness accompanying kidney failure. A whole food, plant-based diet may help some people with kidney disease. A high protein diet from either animal or plant sources appears to have negative effects on kidney function at least in the short term. ↑ Medline Plus (2012). "Kidney Failure". National Institutes of Health. Retrieved 1 January 2013. ↑ Liao, Min-Tser; Sung, Chih-Chien; Hung, Kuo-Chin; Wu, Chia-Chao; Lo, Lan; Lu, Kuo-Cheng (2012). "Insulin Resistance in Patients with Chronic Kidney Disease". Journal of Biomedicine and Biotechnology. 2012: 1–5. doi:10.1155/2012/691369. PMC 3420350 . PMID 22919275. ↑ Moore, EM; Bellomo, R; Nichol, AD (2012). "The meaning of acute kidney injury and its relevance to intensive care and anaesthesia". Anaesthesia and intensive care. 40 (6): 929–48. PMID 23194202. ↑ Ricci, Zaccaria; Ronco, Claudio (2012). "New insights in acute kidney failure in the critically ill". Swiss Medical Weekly. 142: w13662. doi:10.4414/smw.2012.13662. PMID 22923149. ↑ A.D.A.M. Medical Encyclopedia (2012). "Acute kidney failure". U.S. National Library of Medicine. Retrieved 1 January 2013. ↑ Klahr, Saulo; Miller, Steven B. (1998). "Acute Oliguria". New England Journal of Medicine. 338 (10): 671–5. doi:10.1056/NEJM199803053381007. PMID 9486997. ↑ Medline Plus (2011). "Chronic kidney disease". A.D.A.M. Medical Encyclopedia. National Institutes of Health. Retrieved 1 January 2013. 1 2 Dr Per Grinsted (2005-03-02). "Kidney failure (renal failure with uremia, or azotaemia)". Retrieved 2009-05-26. ↑ Amgen Inc. (2009). "10 Symptoms of Kidney Disease". Retrieved 2009-05-26. ↑ MedicineNet, Inc. (2008-07-03). "Hyperkalemia". Retrieved 2009-05-26. ↑ National Kidney and Urologic Diseases Information Clearinghouse (2012). "The Kidneys and How They Work". National Institute of Diabetes and Digestive and Kidney Diseases. Retrieved 1 January 2013. ↑ Kes, Petar; Basić-Jukić, Nikolina; Ljutić, Dragan; Brunetta-Gavranić, Bruna (2011). "Uloga arterijske hipertenzije u nastanku kroničnog zatajenja bubrega" [The role of arterial hypertension in the development of chronic renal failure] (PDF). Acta Medica Croatica (in Croatian). 65 (Suppl 3): 78–84. PMID 23120821. ↑ Appel, Gerald B; Mustonen, Jukka (2012). "Renal involvement with hantavirus infection (hemorrhagic fever with renal syndrome)". UpToDate. Retrieved 1 January 2013. ↑ Genovese, Giulio; Friedman, David J.; Ross, Michael D.; Lecordier, Laurence; Uzureau, Pierrick; Freedman, Barry I.; Bowden, Donald W.; Langefeld, Carl D.; et al. (2010). "Association of Trypanolytic ApoL1 Variants with Kidney Disease in African Americans". Science. 329 (5993): 841–5. doi:10.1126/science.1193032. PMC 2980843 . PMID 20647424. ↑ Tzur, Shay; Rosset, Saharon; Shemer, Revital; Yudkovsky, Guennady; Selig, Sara; Tarekegn, Ayele; Bekele, Endashaw; Bradman, Neil; et al. (2010). "Missense mutations in the APOL1 gene are highly associated with end stage kidney disease risk previously attributed to the MYH9 gene". Human Genetics. 128 (3): 345–50. doi:10.1007/s00439-010-0861-0. PMC 2921485 . PMID 20635188. ↑ "GFR calculator". Kidney.org. Retrieved 2011-09-25. ↑ Chauveau, Philippe; Combe, Christian; Fouque, Denis; Aparicio, Michel (2013-11-01). "Vegetarianism: advantages and drawbacks in patients with chronic kidney diseases". Journal of Renal Nutrition: The Official Journal of the Council on Renal Nutrition of the National Kidney Foundation. 23 (6): 399–405. doi:10.1053/j.jrn.2013.08.004. ISSN 1532-8503. PMID 24070587. ↑ Bernstein, AM; Treyzon, L; Li, Z (April 2007). "Are high-protein, vegetable-based diets safe for kidney function? A review of the literature.". Journal of the American Dietetic Association. 107 (4): 644–50. PMID 17383270.